exceptional view of the port, the "Palais des Festivals" and the Bay of Cannes. exceptional view of the old port, the Palais des Festivals and the bay of Cannes. Completetly soundproofed in a quiet building equiped with an elevator, air-conditioning and re-equipped in 2009 & 2013, this apartment is ideal for a family of four vacationers or for three or four professionals coming to Cannes for the festivals, as well for international boat show or the prestigious royal regattas.The apartment is equipped with WIFI and bradband internet and digital TV. Several possibilities for parking are right nearby. The aprtment includes two balconies looking on the old port. The heating is electric. The living room and the room with the double bed are air-conditioned (hot and cold). The tenant vacationers should arrive with their own personals linens but linens may be supplied for up to 4 persons. "Wonderful view and great location, the best place in Cannes to stay. Soundproofing very good, a lively street but no noise inside at nights." "This is a very attractive apartment with all facilities including internt access and cable TV. The view of the port is fantastic and the apartment is close to the old town and there are lots of good cafes and restaurants nearby. This is an apartment that I would like to visit again." 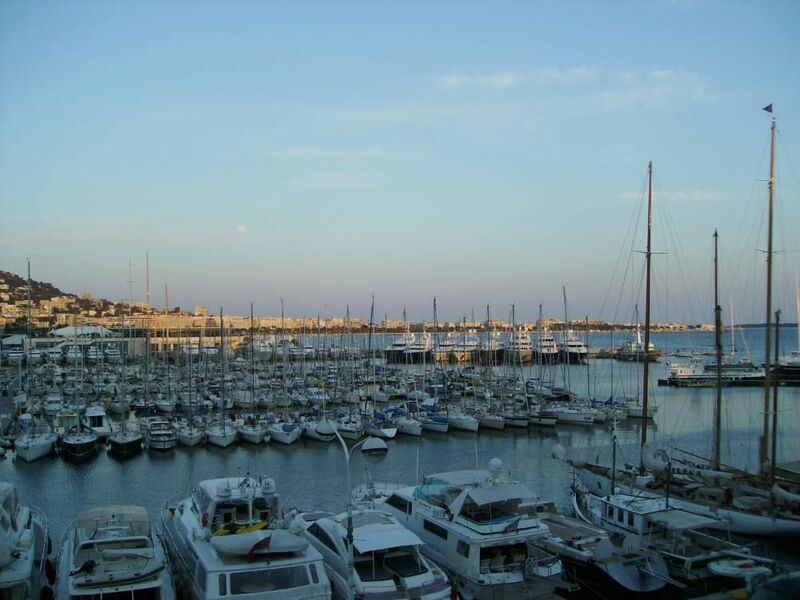 "Great apartment with a fantastic view over the harbour and Palais de festivals. Very helpful owner. We really enjoyed our stay." We have stayed here during the Cannes Lions Festival. It was an absolute pleasant stay. The accommodation is clean, bright and has a great view onto the harbor of Cannes. It is a close walk to the festival, beach and city centre. Just before we arrived Jean texted me that the apartment upstairs was planning a renovation so it could let to some disturbance during the day. He did everything to make sure it wouldn't bother us and even offered a compensation. I would absolutely like to come back and recommend this apartment to others. We have stayed here during the Cannes Lions Festival. It was an absolute pleasant stay. The accommodation is clean, bright and has a great view onto the harbor of Cannes. It is a close walk to the festival, beach and city centre. Just before we arrived Jean texted me that the appartment upstairs was planning a renovation so it could let to some disturbance during the day. He did everything to make sure it wouldn't bother us and even offered a compensation. Which gladly wasn't necessary. I would love to stay here again next year and would recommend it to everyone. At the foot of the old city, just a step from the centre and from the Croisette.Several possibilities for parking are right nearby. tarif dégressif en fonction de la durée, arrhes 25% à la réservation, propriétaire non présent sur place mais représenté par un ami. Pour les demandes venant de France, un échange téléphonique est souhaité. Nettoyage de sortie et mise à disposition du linge (draps, serviettes, torchons et tapis de bain) sont des options à régler en cash à l'arrivée (reçu sur demande). ces options sont facturées à prix coûtant: nettoyage 65€; location de linge 25€ par personne.